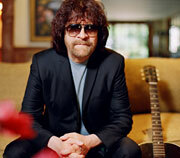 As the creative force behind Electric Light Orchestra and a singularly accomplished singer, songwriter, guitarist and producer, Jeff Lynne is one of rock's most iconic-yet mysterious-figures. Please join us as we help celebrate his return to make some new waves and shed a little electric light with a screening of Lynne's illuminating and entertaining documentary, Mr. Blue Sky: The Story of Jeff Lynne and ELO. Not just your standard "rock doc," it's also a mystery movie that, once and for all, explains: who is this man, Jeff Lynne, and how has he had such a tremendous musical influence on our world? The answer-as told by Lynne himself and such distinguished collaborators and friends of Jeff as Paul McCartney, Ringo Starr, Tom Petty, Joe Walsh, Olivia and Dhani Harrison, Barbara Orbison and Eric Idle -is that Lynne is a true man of music for whom the recording studio is his greatest instrument. After the screening, Lynne will participate in a discussion about the film, moderated by Vice President of the GRAMMY Foundation and MusiCares, Scott Goldman, and will take audience questions.